Agroforestry is the establishment and management of multi-purpose trees on farms and rural properties. 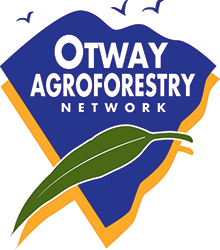 OAN (Otway Agroforestry Network Ltd) is a landcare group that encourages farmers to establish and manage trees for the reasons that matter to them. Landholders in our region want trees on their farms to shelter farm stock and crops; control soil erosion and dryland salinity; enhance their property values; and, if at all possible, generate alternative sources of income. Fortunately, what is good for private landholders is also generally good for their communities and our country: trees on farms can help improve the water quality in our streams; enhance and connect wildlife habitats; capture and store carbon dioxide; reduce the need to harvest our public native forests; and, provide regional business and employment opportunities. OAN sees the strategic placement and management of trees and forests on farms as an important part of the infrastructure that underpins the economic, environmental and social values of our agricultural landscapes. The role of the group is to help our members design and implement projects that will achieve the range of benefits they are looking for. After almost 20 years it is clearly evident that our approach leads to landscape change - change that is driven by, and reflects, the diverse needs and aspirations of those living within our rural communities. If you think growing trees and shrubs might enhance your farm then OAN s the group for you! THIS SITE IS HAVING A REVAMP . . . AT LONG LAST!